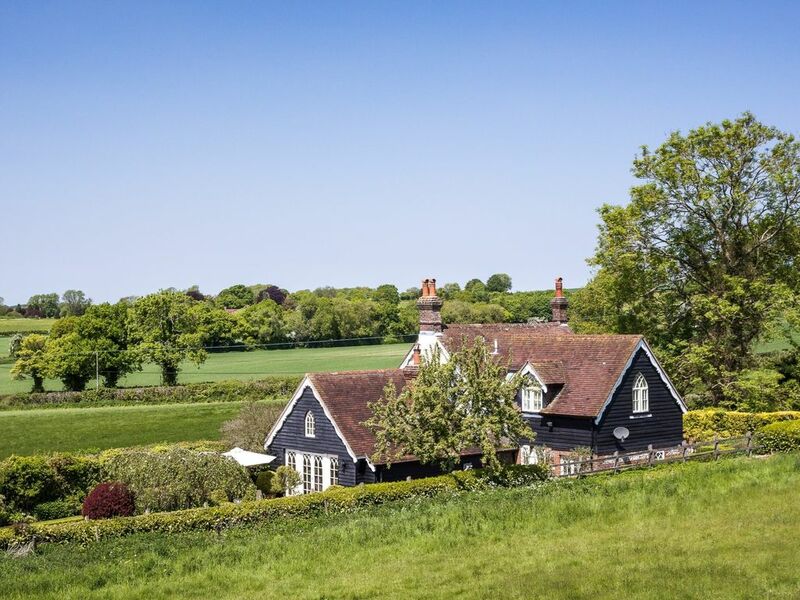 This charming and unique detached cottage is set in a rural position surrounded by beautiful countryside. Located in the Meon Valley in the South Downs National Park many walking and cycling routes can be found locally including the Meon Valley Trail itself taking in the picturesque landscape that this area is renowned for. Why not try out the friendly local pubs which can be found in the nearby villages or take a trip to Alresford where you will find a good selection of local amenities. The cathedral city of Winchester has vibrant high street offering a great selection of restaurants pubs shops and a theatre. For history and garden lovers a visit to Hinton Ampner - a nearby National Trust treasure is a must. From the gravelled parking area to the side of the cottage a stable door leads into the homely and welcoming kitchen. This stylish room is the ideal spot to enjoy a leisurely breakfast and is well-equipped with an electric oven and electric hob American style fridge/freezer microwave and dishwasher. To the rear of the cottage is a useful utility area with washing machine and tumble dryer the ideal spot for muddy boots and a separate WC. Also leading from the kitchen is a dining room and a cosy snug complete with a wood burner. Heading across the hallway you will find a stunning bright and airy lounge with a Smart TV with Sky Sports and Netflix available and an abundance of striking features which include a wood burner and a vaulted ceiling. Heading back through the snug to the front hallway you can take the stairs up to the landing on the first floor. To your left you will find a charming double bedroom to the front of the cottage with views over the fields beyond and an en-suite bathroom where you can take a soak in the bath or enjoy the separate shower. Opposite there is an inviting king-size bedroom which also overlooks pastureland to the front of the property. Next is the Jack and Jill style bathroom which has a bath separate shower and WC. Three steps lead you to a generous super-king-size bedroom which has a beamed and vaulted ceiling and also shares the bathroom. With changes of level character features exposed beams and wonderful views the cottage has a homely ambience coupled with all the conveniences of modern living. Heading outside from the kitchen you will find an inviting terrace with table and chairs. Ideally positioned tucked behind the cottage it s the perfect space to enjoy a meal. Doors from the lounge lead to a second terrace also with furniture designed to catch the evening sun and spectacular sunsets. Leading on from here is a stretch of lawn with formal borders and low level hedging perfectly positioned to make the most of the views. Lawns and low hedging lead down the garden to a garage which can be used for bike storage and a gated gravelled area with parking for three cars. A second gravelled parking area can be found to the side of the cottage with parking for a further two cars.